In spite of reports that the Spanish double champion is close to signing a deal with Renault, Red Bull continues to chase his services. Alonso's manager, Luis Garcia Abad, is reported to have met with Dietrich Mateschitz and Gerhard Berger in Madrid yesterday. The inclusion of Berger raises the interesting possibility of a driver shuffle not previously imagined by the rumor machine: a move for Coulthard to Toro Rosso to make way for Alonso in the Red Bull car. In this scenario, it is suggested that Sebastien Bourdais would be asked to endure one more year of Champ Cars and, presumably, bring his tally of championships to five. As unlikely as this sounds, it would agree with the STR bosses' complete disregard for driver contracts in their pursuit of success. One would hardly blame Bourdais for telling them where they could shove their second-rate drive, if the rumor is correct. But, ironically, the idea that Coulthard should drive in his place is actually just what STR need - a driver with experience who can get to grips with the car and tell the team what is wrong with it. And the prospect of Alonso driving for Red Bull is also very interesting. Even without the inclusion of Ross Brawn in the team, a possibility that gains credibility from the lack of news from Maranello, Red Bull have assembled an impressive team. 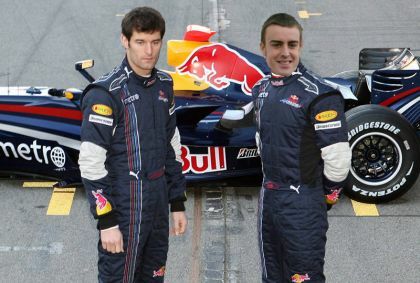 Adrian Newey's designs should be about ready to break through to the big time in 2008, the development of his first Red Bull this year having pointed the way to go, and the team are a good outside bet for winning races soon. Which is not bad for a non-manufacturer team these days. We tend to forget that it is only the huge amount of money available to RBR that somehow separates them from the traditional privateer constructor like Williams. They inhabit a sort of no-mans-land in between the independents and the manufacturers, most closely resembling the Benetton team of former years. And that reminds us that Benetton managed to win an occasional championship once they had found a driver capable of galvanizing the team; is it possible that Alonso could do the same for Red Bull? What really astounds me about Red Bull, however, is the apparently inexhaustible supply of money invested by that man, Dietrich Mateschitz. I ask myself how it is possible that the sales of an energy drink can support such massive expenditure. Do you drink Red Bull? I certainly don't and I don't know anyone who does, either. Yet someone must be buying the stuff, considering the profits generated from its sales. DC ain't going anywhere - Alonso is heading to Renault. Maybe just wishful thining on my part! Mateschitz won't be interested in the Spanish sponsors. He likes to dictate the entire appearance of the car so that Red Bull gets its message across. Given that DC instigated the deal with Adrian Newey I cannot see him being pushed out. I also cannot see him accepting a drive with the second team. He would seem to be the ideal Alonso team mate. Doesn't stir things up. Technically good. Fast enough but not too fast. On the other hand if Webber is as good as his publicity he is going to qualify ahead of Alonso regularly and Fernando is not going to respond well to that. My belief was that he would drive for Renault but the news about Renault being hauled up before the FIA for possession of McLaren data may make that team look very unattractive to him. All true, Steven, and it certainly makes more sense to send Webber across to STR. But how would he take to that? I can see him getting annoyed enough to walk out of the team altogether - he's been close to leaving F1 in the past. The funny thing about Renault being called before the FIA is that we all knew it was going to happen but it's a bit of a shock now it has. I suppose they have to make it look as though they're dealing with Renault as severely as they did McLaren but I doubt anything will come of it. No doubt it will be found to be an entirely different set of circumstances and therefore not worth punishing in the same way. It almost looks like Bernie dictated the timing. The McLaren business is no longer filling the papers. Alonso looks like he is going to make a decision who to drive for this week so then the papers will go quiet on F1 for a couple of months and then this happens. I think if I was Max I would open the whole question out this time and interview all the teams. He should have done that when McLaren were in the dock because we all knew the Renault story was bubbling away in the background and we have seen the letter from Nigel Stepney saying that he was receiving info from Mike Coughlan. Funny how things comes around. That also shows of FIA's and Max's disabillity to look at things in an objective way. Did'nt it ever ocured to them that teams inevitably borrow from each other? Did'nt they ever thik of that in a sport as competitive as F1, teams do almost anything to get the edge? Even if it means to sneak into the office of a couple of competitors and "borrow" some documents? You don't need to be in F1 to know that this is the common way to do research? If you se something new on a car, that seems to be better that the thing you have on you rcar, you copy it....as simple as that. Look at the wings McLaren had on their airintakes for a couple of years, they was never really evident of making the car perform any better, but have in this season evolved into the small wings on the monocoque instead. But the thing that they are on almost half ov the cars on the grid makes good evidence of what i wrote above. I think the truth of the matter is that there was much more to the "spy" scandal than it seemed. Looking at the way McLaren were singled out for harassment this year, even before the Ferrari documents were discovered, makes it seem that the FIA were determined to make things as difficult for the team as possible. The documents were just a perfect opportunity to really throw the book at them. Not that I think it would be fair if McLaren had used the documents - I just don't think they did and the emails merely prove that Coughlan and his friend de la Rosa discussed information that came from Ferrari via Stepney and probably wasn't in the documents at all.